Quotes and aphorisms is something I simply love for I believe they have secrets hidden in them. I thoroughly enjoy reading them and always keep one such book handy with me just incase life throws up some surprise and I am unable to decipher it, I might need it. Such books have never failed to surprise me, however many I read I still feel there are many secrets out there waiting to be read and experienced. Nassim Nicholas Taleb is a Lebanese American essayist and scholar whose work focuses on problems of randomness, probability and uncertainty.His 2007 book The Black Swan was described in a review by Sunday Times as one of the twelve most influential books since World War II. (source: Wikipedia) To know more about the author read HERE. The author’s previous work The Black Swan is critically acclaimed hence making me want to read this author at the next opportune moment. Random House gave me this opportunity by offering this book for review and was I blessed – I surely was! What a book! 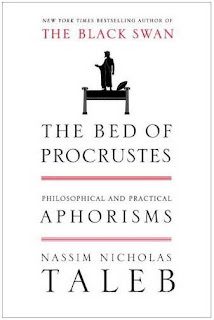 Is the first thought that comes to my mind as I finish reading The Bed of Procrustes by Nassim Nicholas Taleb. 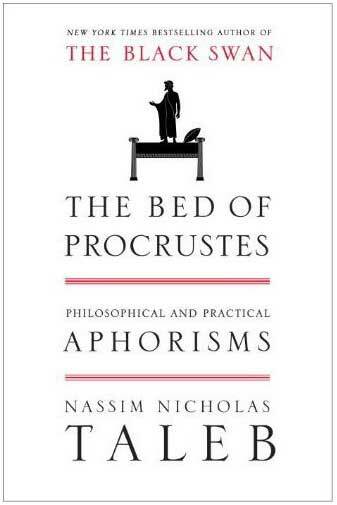 This book is a collection of philosophical and practical aphorisms by the author on everything under the sun. And most of them take you by surprise as they make you feel Oh! That was so obvious, how come I never noticed it. I loved the segregation the author has done under various heads and provided quotes based on them. More so, his thoughts seem so practical and logical that at the end of reading it all, you chuckle to yourself smiling at his wittiness and consider yourself lucky as if he has just whispered some age old secret in your ear. Though the language of the book is not a day to day language and not something I can call easy to connect but it surely makes a good interesting read for an intelligent mind as it challenges your wittiness to no extent. Recommended for people who enjoy reading such quotes which add grace to the already beautiful language of English. This book is like Kitkat - crunchy, chocolately and worth taking a break from the real world for!